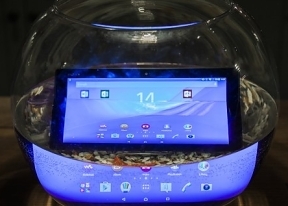 While the Xperia Z4 smartphone was sadly missing in Sony's booth, the company did bring the Xperia M4 Aqua midranger. The Aqua moniker quickly reveals its chief claim to fame, but it's not a one-hit wonder either. The IP67/IP68 certified Xperia M4 Aqua comes with a 5-inch display of 720p resolution, which is reasonably sharp at 293ppi. It's an IPS panel too so it offers accurate colors and wide viewing angles. Sony has skipped on the TRILUMINOUS tech on this one though. The generous bezels mean it's not terribly compact for a 5-incher, but it's still reasonably pocketable. The exact numbers are 145.5 x 72.6 x 7.3mm, so it's actually pretty thin, and weighs in at 136g. It's a capable package too, with a Snapdragon 615 chipset paired with 2GB of RAM. The 8GB internal storage is somewhat limiting, but a 16GB version will be available as well, and a the microSD slot provides further expansion options. Major photography occasions can be covered by the main camera with 13MP Exmor RS sensor. The narcissistic folk will enjoy the 5MP selfie unit with 88-degree wide angle lens. A feature, which sadly makes it to fewer smartphones these days, is the dedicated shutter button. The Xperia M4 Aqua doesn't skimp on connectivity options and comes with 2G/3G support as well as cat.4 LTE for download speeds up to 150Mbps. Retail price is quoted at €299 although that will obviously vary by market/carrier. Four color options will hit the shelves with a Silver on, in addition to the White, Black and Coral versions pictured below. 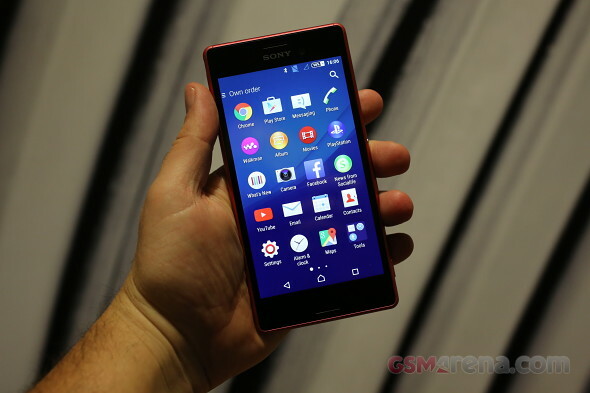 You can get a feel of the Sony Xperia M4 Aqua in the following video.